When introduced, some products are no-brainers for automatic buzz. If Trader Joe's were to bring out a brand-spankin' new cookie butter innovation, you know the word would spread like, well, butter. And some things like bacon-y popcorn or maple-y water just sound too interesting or intriguing or unique or kinda weird to not want to try. 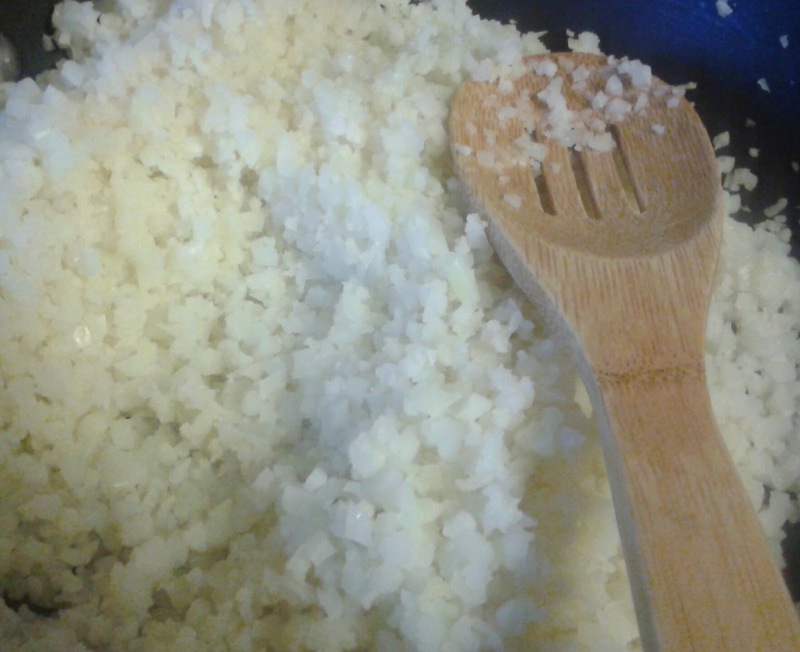 And then, over by itself, you have itty bitty cauliflower, all riced and diced up. Make no mistake: for about the past week we've been bombarded by the introduction of Trader Giotto's Organic Riced Cauliflower for about the past week by fans, particularly those interested in super-healthy fare. Take, for instance, my friend Alison who's put in an assist on the blog here before - she and her husband are into the Whole30 scene so she when she first stumbled across it, she was first to let me know. Soon enough, through Facebook, Instagram, LiveJournal, etc, a lot of you have said "hey, try this out!" So, I have. As revealed on our forthcoming podcast episode, Nathan too, but I beat him to the review. All this sack of apparently Italian inspired micro-diced cauliflower consists of is.....cauliflower and a smidge of salt. Or so the ingredients say, I can't taste any added sodium at all. It's in the frozen section, weighs 12 ounces, and costs $1.99. The recommended prep method is take out of bag, heat in saucepan until warmed and excess water (not a lot to begin with) dissipates, and voila, it's ready in minutes. 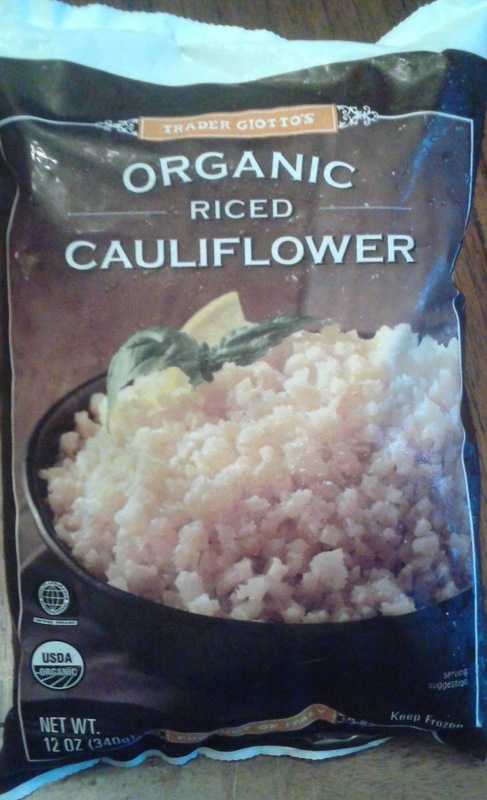 Unsurprisingly, it tastes just like cauliflower, with a slightly grainy texture (more than anticipated) that I'd say veers more towards brown rice-like than white. I made some up the other night to go along with a shrimp and broccoli stirfry, then had some leftover the next day under some chicken and my favorite barbeque sauce, and both times, with some willingness and a little suspended belief, it tasted fairly remarkably like regular rice. It's not the exactly the same, of course, but it's reasonably close, and probably can be used pretty much any way that regular old rice can. Two words: Absofreakinglute convenience. I've shied away from a lot of Paleo recipes just because of the sheer amount of time and energy involved. Listen: I work more than fulltime, and when I get home I have about an hour (ideally) to make dinner, get through dinner with a finnicky toddler, and get two kids into bed. I don't have the time or energy to rice a cauliflower through other means I have heard of, like steaming and pushing through a colander (that also sounds like a lot of clean up), or using a high-quality food processor. I've heard that's possible, though Sandy is skeptical - I don't know, I'm just parroting what I've heard. It doesn't matter, we don't have one anyways. So, to have an option like this, just frozen, ready to go, and can easily fit into my diet on a night I should be strict about it, for just $1.99 which is likely cheaper than a head of organic cauliflower (haven't been in the market recently, don't know) - that's a pretty sweet deal. From the sounds of it, a lot of people think very similar thoughts. I'll take this actually as a ringing endorsement in its own way: Sandy was pretty impartial about it. She's not a huge cauliflower fan, so she was skeptical when first trying it. "It's not rice, and I can tell it's not, but...it's not bad," she said. "I don't mind it that much." That translates to a three in her book. Me? I love it. It's an easy and inexpensive way to sneak more veggies into my family's diet - I can't wait to make some fried rice with it, in fact. Pretty great stuff for the cost and convenience, and for that alone, I'm throwing it some perfection. I'm definitely going to try this. I have made "Cauliflower Rice" before by using a grater to shred the head of cauliflower. It's not easy and makes a huge mess. I look forward to some simplicity! if u have a ricer it makes it easier.. chop up into pieces then put in ricer. I love this idea! I'm not following a paleo diet, but this sounds and looks healthy and good. Gonna get this one next time! Had the superfood pilaf yesterday and was disappointed. I must find this! My food processor gets finicky and cleaning it afterwards gets to be a chore. I am so very excited about this product! I love cauliflower rice, but I agree that it is a bit of a deterrent to have to drag out my blender and do all of the clean-up just to get the cauliflower prepped. So great! You can actually make mashed cauliflower and treat it just like mashed potatoes. This sounds even better. And yes, convenience matters. I'm never going to buy a head of cauliflower even though I love it. I would buy this stuff. I will have to look for this next time! That price isn't bad. When I make macaroni and cheese out of cauliflower, I use 1 cup of milk per 8 ounces of cauliflower florets. Which is about half or little over half a head of cauliflower. Boil the milk and cauliflower together, puree in a blender. Add shredded cheese and voila! You have healthier macaroni and cheese. Just went to my Trader Joe’s in Chapel Hill NC yesterday and they are out of it. Not sure when it will be restocked. I made this last night in a non-stick skillet. Used about a half bag of the cauliflower rice and a half bag of the frozen mushroom medley. Seasoned it with some lemon pepper and a bit of fresh lemon juice. It is wonderful as a crust for pizza mixed with cheese.